This French fried onions recipe is a copycat French’s onions (or Durkee onions) and are so easy to make at home! These are crispy with plenty of onion flavor and a little spicy kick from the coating that’s used. The trick is to slice the onions super thin and fry them until they are crispy but not burnt. They work great on the top of casseroles, ground to crumbs as an ingredient, or as snacks! You’ll need: white onions, buttermilk, flour, Tony Chachere’s seasoning, oil for frying, electric deep fryer or deep pot for on top of the stove frying, paper towels for draining. What’s green bean casserole without French’s onions? I mean, even when I ditched the cream of mushroom soup because homemade I still used the French fried onions from the can. I had no idea that you could make them yourself — and I realize how silly that sounds now but honestly it just never occurred to me! Well, Thanksgiving came and I was madly throwing things together trying to get everything done. I realized at the very last minute that I did not have the onions for the top of the green bean casserole. I did what any red blooded American foodie would do… I had a meltdown. Once that was out of the way I hit up Google to see if there were any French fried onions recipes out there at all. And…. Jackpot! I found this Copycat Durkee recipe. It’s relatively simple and straight-forward. I did make a few adjustments because I wanted a little more heat to the crunchy onions than a plain coating would give. I did learn that the thinner you can slice the onions the crispier they will get without burning. You don’t want onion rings, you want them to be crispy all the way through. Buttermilk just makes that intense onion bite soften and become mellow – plus, I had some leftover buttermilk. 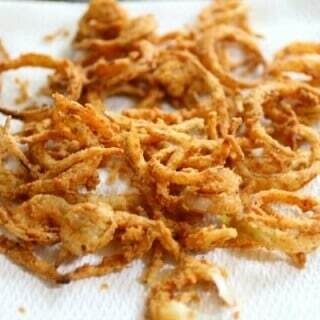 Make these French fried onions and use them in any recipe that calls for the French’s or Durkee Onions. You can store them in an airtight container in a cool pantry for at least a few days. Mine didn’t last longer than that! What’s new? A brand new store full of things to help you make the recipes, celebrate the days, and create the memories! Check out Restless Chipotle & Co. As always, thanks so much for being a part of Restless Chipotle! If you are going to make French fried onions (or any fried food) then an electric deep fryer is just about a necessity. This is the one that I use and I just love it. It’s got two small baskets for when you are frying two different things and it also comes with one big basket. It heats quickly and evenly and is easy to clean. I’ve been using mine for 4 years and it’s still going strong — and I fry A LOT. I love the flavor of this copycat French’s Onions recipe. 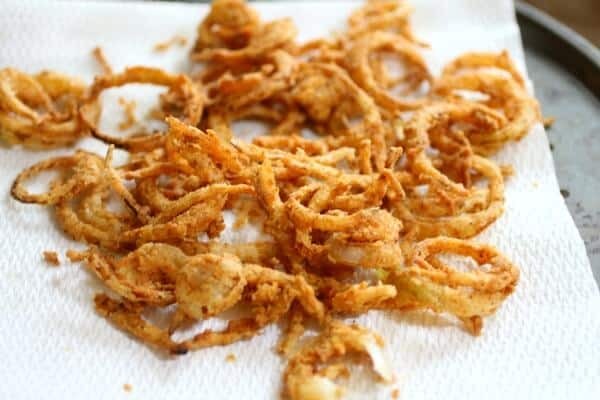 Crispy with a mild onion flavor, you can use these French fried onions in any recipe that calls for the store bought kind. If you love this recipe please give it 5 stars! Copycat French's Onions are crispy and full of flavor just like the original. These have a little seasoning added to make them even better. Heat the deep fryer up to 375F. Mix the flour and the Tony Chachere's Creole Seasoning. Add the onions to the buttermilk and let stand for 10 minutes. Drain and then dredge in the flour . Fry, a few at a time, until golden brown and crisp. Does anyone know if I can substitute whole milk instead of buttermilk? yes. it will be slightly different but not a lot. OMG these are amazing! My husband is a glutard, so I substituted GF flour, and they came out SO much better than any other recipe I’ve tried. THANK YOU! Thanks for the great recipe! I wanted to make these but I hate wasting all of the oil it takes to use my deep frier unless I’m going to deep fry several things at once or make a really large batch. I tried pan frying in about an inch of oil. I tested with a cooking thermometer to get the temperature right and they worked out great! Thought my experience might be helpful to share for others who don’t want to waste oil or who don’t have a deep frier. PS: Does anyone know how long these will keep in an air tight container before they go stale or soggy? Made these and they are delicious and easy, thanks for the recipe. You can also make your condensed cream of mushroom soup for that green bean casserole. It has taken me about 18 months but I have gon away from all canned and processed foods, you can make everything from scratch, if you can’t figure it out someone has, that’s how I found this recipe. Google copycat recipes. We fight over the onion when we have greenbean casserole. Since I’m the chef I usually eat a few extra out of the French’s container. Love that you can make homemade. 🙂 It’s even better than the canned. You can use anything that slices thinly. Pampered chef makes an awesome mandolin slicer. The green bean casserole wouldn’t be the same without these! I love that yours are homemade! This is the BEST part of green bean casserole! Love it! I love copycat recipes! These look great! I have never thought to make these myself! Silly! I bet I could make these GF really easily. Thanks for sharing! Love this!! 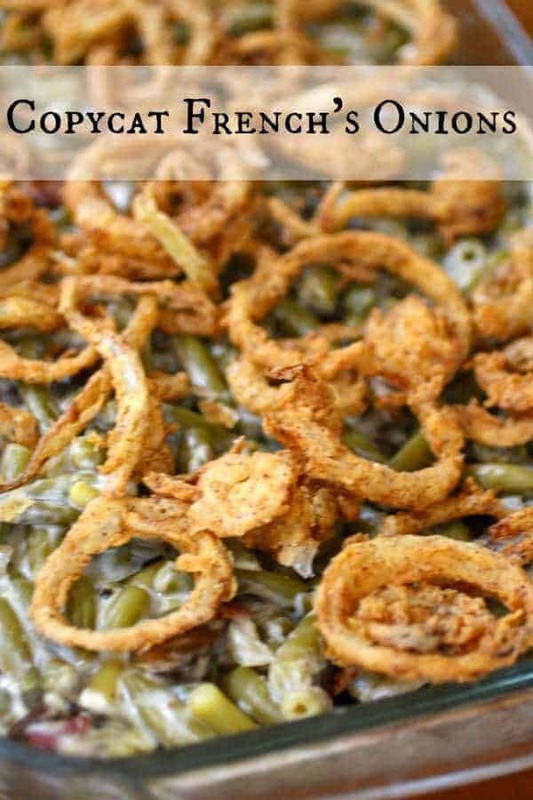 Yeah, the fried onions really are the best thing about green bean casserole, but I hate buying the processed ones too. One year I just flat out made onion rings from scratch to top it. A pain, but very, very good. That’s basically what you are doing here except that you fry them enough that they don’t go bad or get soggy. I adore “make your own” recipes. Anything you can make at home, instead of buying something with crazy ingredients, is worth knowing. definitely. I think I am going to work on this type of thing in 2016… I am intrigued but the knowledge that I can copy stuff I normally buy. I’ve always loved these, but never thought to make them at home. I know. I keep wondering why it took me 30 years to figure it out? LOL! LOVE those crisp little onions and these look like the perfect homemade version! They really are. I love them.